Anyone remember Barbaro? You know, the horse that wouldn't die? Also known as, the story that wouldn't die on ESPN? I sure do. 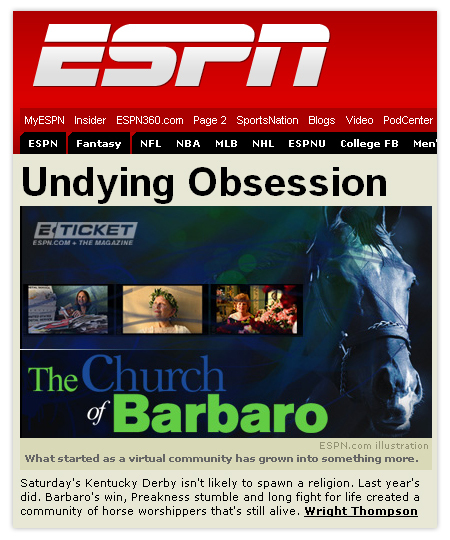 Well, wouldn't you know it, ESPN can't seem to drop it either since the Kentucky Derby is near. Don't you think the title says it all? dude. i hate that stupid horse and i hate espn. i wish fsn would at least try to compete with them. but how awesome are the warriors? please tell me you have been watching this. I totallty agree. I didn't care about that horse, but since all this coverage has been going on so long I have come to hate that horse. ESPN is so stupid sometimes. All this coverage of the NFL draft was already about to make me go crazy, when I saw the ultimate is over-coverage ever. They had a mock draft of the 2008 NFL draft. Are you kidding me? There is a whole season of college and pro football between now and that event. Anything could happen. What is the damn point in having that discussion. In my option, something less than zero. Maybe it wouldn't be such a big deal for ESPN if they covered more sports... like, oh, Soccer? I know they focus on the sports that make a lot of money in America, but it seems like they could cut down on a lot of regurgitated stuff if they expanded instead of making more channels (ESPN2, ESPN Classic, ESPNews, ESPNU).